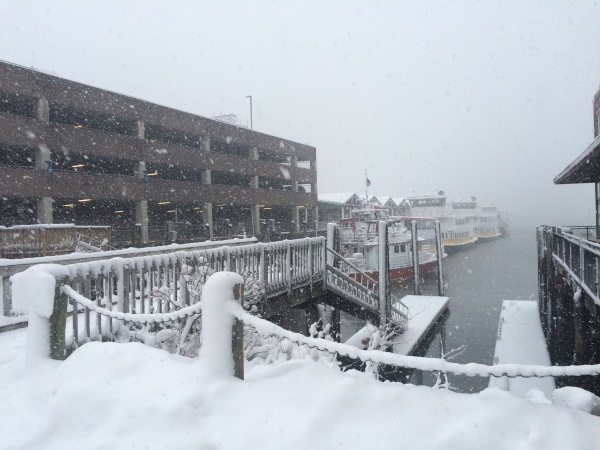 After a long and technical discussion of the Winter forecast last month that was done on a hemispheric scale, I’m going to bring it back to explaining some of the weather that we experience in Maine on a day-to-day basis. This month’s column will discuss what types of precipitation fall from the sky here in Maine, how they form, and how you can help forecasters like me to predict them. There are two easy types of precipitation: rain and snow. Snow occurs when abundant moisture and lift combine in a cold atmosphere and the resulting flakes fall through subfreezing air all the way to the ground. Rain happens when warm air occupies either the lowest level of the atmosphere or all of it resulting in any snowflakes that form aloft to melt and stay liquid all the way to the ground. But what happens when there’s a layer of warm air aloft that partially or fully melts the snowflakes and then a layer of cold air near the surface to refreeze them? How about when it’s raining even though temps both at the surface and aloft are well below freezing? ​Check our graphic above from the National Weather Service and you will see we get one of two most common “mixed precipitation” types: freezing rain or sleet. Freezing rain happens when snow falls into a deep warm layer aloft. The snow then melts into raindrops before they fall into a shallow layer of cold air right near the surface. The layer of cold air isn’t deep enough to refreeze the rain, instead it freezes on contact with subfreezing objects on the ground like your windshield, trees, roads or power lines. Ice storms can wreak havoc on the power grid as trees are weighed down by hundreds or even thousands of pounds of ice. I’m sure Up Portland readers have memories of the ice storms of December 2008 and January 1998, both of which brought widespread destruction of the power grid. In the 1998 ice storm, up to five inches of ice fell across interior Maine causing a near complete destruction of the power grid. The December 2008 storm was much less damaging though still resulted in significant impacts. The bottom line is that significant freezing rain events can be extremely destructive and even minor ones, as we had last Spring (at right) can turn roads into skating rinks and damage trees and wires. 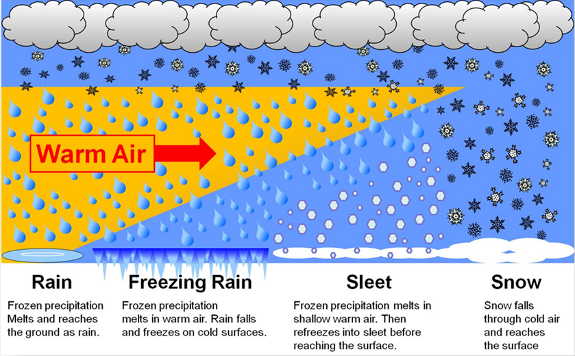 If the layer of cold air near the surface is more significant and the layer of warm air aloft less so, sleet usually falls from the sky. Sleet happens when snowflakes fall into a layer of cold air, melt, and then enter that cold layer near the surface. However, unlike in freezing rain, this time the raindrops can completely refreeze into ice pellets. They look almost like hail but sleet is not hail. Hail forms in violent thunderstorms during the Spring and Summer months. Sleet forms from refrozen raindrops in the Winter. Sleet usually has no significant impacts on trees or power lines, though it can make for slippery roads and sidewalks. There’s another commonly confounding precipitation type you may encounter during the Winter months in Maine known as freezing drizzle. Freezing drizzle can occur at any temperature below freezing and liquid drizzle has been observed at temperatures well below zero fahrenheit. 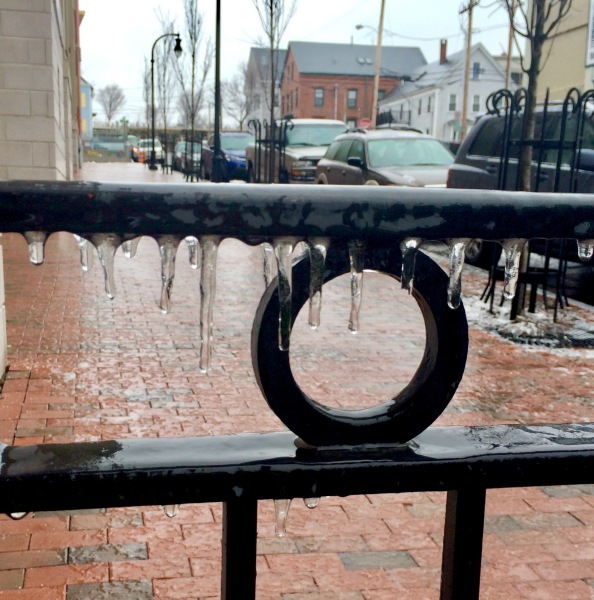 How can liquid drizzle fall from the sky at such cold temps? The answer lies in something called the dendritic growth zone. This is the part (zone) of the atmosphere where snowflakes (dendrites) form (grow). When this area of the atmosphere (wherever the temperature is between -10 and -20 degrees celsius) is full of moisture and the air contained in it is rising, snowflakes can grow and fall from the sky. When this area is dry or lacking sufficient rising motion, no snowflakes can form and the water droplets in the atmosphere fall to the ground as supercooled liquid, freezing on contact. Freezing drizzle almost never amounts to anything significant enough for damage to trees and power lines though it can definitely make for slippery travel conditions! Depending on the exact conditions in the atmosphere and the depth/caliber of warm and cold layers, different types of precip can fall from the sky. A sufficiently moist, cold, and lifted atmosphere will produce snow. Without the moisture or the lift, freezing drizzle will form due to a lack of ice crystals in the cloud layer. If there’s a shallow warm layer aloft, snow will melt and then refreeze into sleet. If the warm layer is deep and warm enough, snow will melt into rain but not have enough time to refreeze in the shallow cold layer resulting in freezing rain. If the air near the surface is too warm, snow will melt into rain and fall that way all the way to the ground. All this precip type stuff is complicated isn’t it? It’s even harder to forecast than it is to understand and that’s where forecasters across the world need your help. All you have to do to help improve precipitation type forecasts is to download the free mPING app from the Apple or Google Play store, then when you see precip falling from the sky, just press the appropriate type on the app. The data you send in will help researchers at the National Severe Storms Laboratory compare what actually fell from the sky (your data) to what radars and other instruments thought fell from the sky. This will allow them to figure out better ways of detecting and forecasting correct precipitation types. That’s all for this month and if you’re curious about how the Winter forecast is looking now, check out the update I posted on my blog at forecasterjack.com Thanks for reading and I’ll be back next month with more weather. Mixed Layer —The mixed layer is the layer of air that mixes up and down to the surface. It is bordered aloft by any sort of inversion where temps rise with height. It can also be capped by a layer of saturation though there are some cases where air can mix up and down in a saturated environment. Winds in Maine are almost always strongest when they are blowing from the North-West though notable exceptions include nor’easters (NE winds) and sou’easters (SE winds). Strong NW winds occur more frequently because the events needed to trigger them are less extreme than a powerful nor’easter or powerful low pressure to the west. All you need is a decent cold front and the NW winds will kick into gear. This is due to the deep mixed layer in a downsloped cyclonic flow environment. The winds at all levels of the atmosphere are unidirectional and advecting cold air into the region. This means that there are no inversions and the air is dry as well as turbulent due to the mountains. This results in stronger winds aloft mixing down to the surface, even without strong thunderstorms (as we saw in momentum transfer last ‘winter’). We often see strong NW winds this time of year because of deep mixed layers behind strong cold fronts! Inversion — An inversion occurs when the temperature of the air rises with height rather than cools. In the troposphere, as you get higher the air cools off. This is why mountains usually have more snow at the top than at the bottom and why airplanes have to be carefully insulated. Sometimes, however, there are narrow regions where the air warms with height. These are known as inversions and are responsible for some of the precip types discussed above, such as freezing rain and sleet.